In medium bowl, whisk egg yolks with sugar until smooth. In 2-quart saucepan, bring whipping cream to a simmer over medium-high heat. Add white chocolate (chopped in small pieces) to simmering whipping cream. Turn off heat and whisk until white chocolate is melted. Add white chocolate mixture to egg yolk mixture one tablespoon at a time, whisking continuously to prevent eggs from scrambling. Whisk until smooth. Add vanilla. Pour into four ramekins or custard cups. Place cups in 13x 9-inch baking pan or broiler pan. Add enough water so cups sit in 1 to 1-1/2 inches of water. Bake until set, about 45 minutes. Serve warm, at room temperature, or refrigerate overnight. 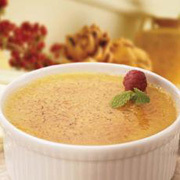 For a delicious crunchy surface: Sprinkle the tops of the creme brulee with 1 teaspoon of sugar and place under broiler until caramelized. Recipe and image used with permission and provided by Ghirardelli Chocolate Company.